A stress fracture is an incomplete fracture. 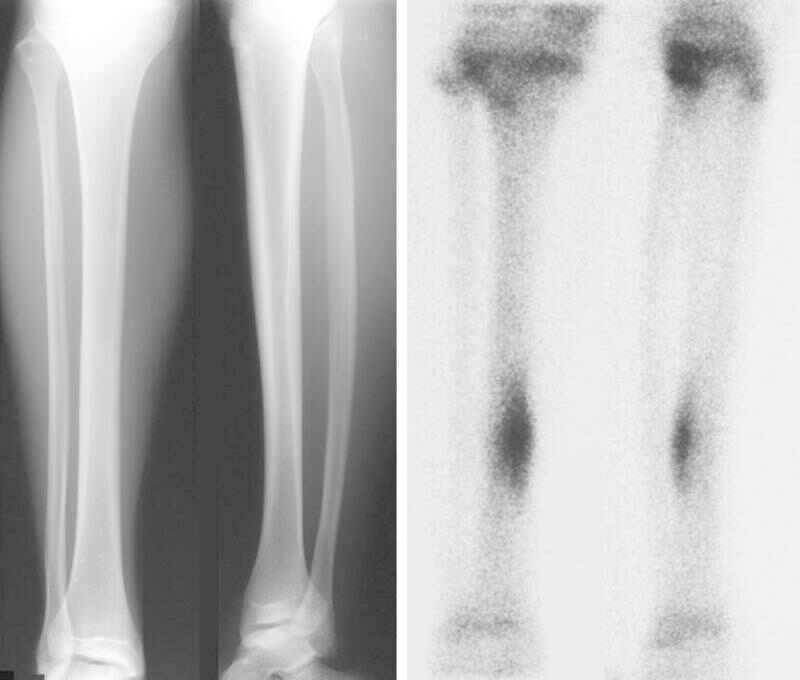 It is caused by “unusual or repeated stresses” This is in contrast to other types of fractures that are characterised by a single, severe impact. 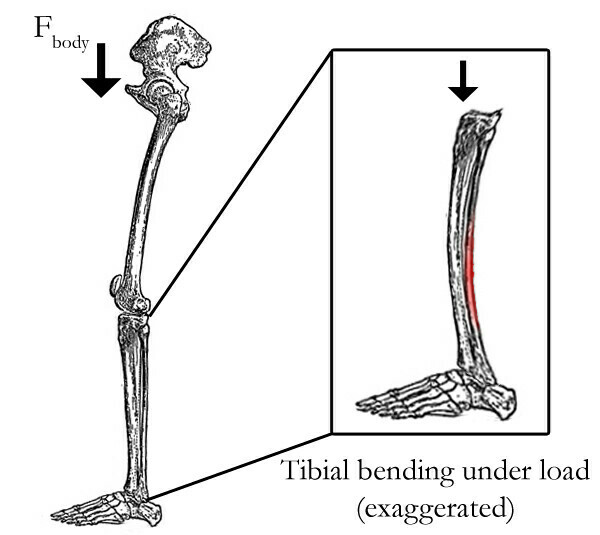 It typically occurs in weight-bearing bones, such as the tibia (bone of the lower leg), metatarsals (bones of the foot), and less commonly, the femur. 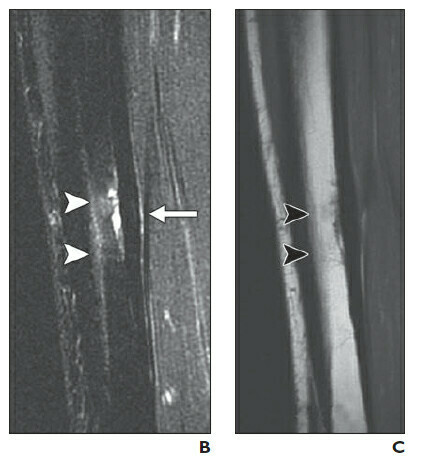 The bone suffers a “stress reaction” involving inflammation (see below) and subsequent sensitivity. a generalized area of pain and tenderness associated with weight bearing. Recovery time varies greatly depending upon the location, severity, the strength of the body’s healing response and an individual’s nutritional intake. Complete rest and a cast or walking boot are usually used for a period of four to eight weeks, although periods of rest of twelve to sixteen weeks are not uncommon for more severe stress fractures. After this period activities may be gradually resumed, as long as the activities do not cause pain. One general rule is to not increase the volume of training by more than 10 percent from one week to the next. Physiotherapy rehabilitation includes muscle strength training to help dissipate the forces transmitted to the bones, Biomechanical Assessment, Return to sport planning, Core Stabilising, Sports Specific Retraining. Severe stress fractures, surgery may be needed for proper healing. The procedure may involve pinning the fracture site, and rehabilitation can take up to six months. Nutritionist review to ensure an appropriate diet and timing of intake. Bones are constantly attempting to remodel and repair themselves, especially during a sport where extraordinary stress is applied to the bone. The bone builds strength by laying down bone along the lines of force which greatly strengthens the bone while maintaining their light weight. Over time, if enough stress is placed on the bone that it exhausts the capacity of the bone to remodel, a weakened site—a stress fracture—on the bone may appear. This is an example to overloading normal bone. Both muscles and bones serve as shock absorbers (see picture below). However, the muscles, usually those in the lower leg, become fatigued after running a long distance and lose their ability to absorb shock. As the bones now experience larger stresses, this increases the risk of fracture. Sports such as tennis, athletics, gymnastics and basketball are highly susceptible to stress fractures. Without sufficient rest between workouts or competitions, an athlete is at greater risk for developing a stress fracture. One method of avoiding stress fractures is to add more stress to the bones. Though this may seem counter-intuitive (because stress fractures are caused by too much stress on the bone), moderate stress applied to the bone in a controlled manner can strengthen the bone and make it less susceptible to a stress fracture. An easy way to do this is to follow the runner’s rule of increasing distance by no more than 10 percent per week. This allows the bones to adapt to the added stress so they are able to withstand greater stress in the future. Strengthening exercises also help build muscle strength in the legs. Strengthening these muscles will prevent them from becoming fatigued quickly, allowing them to absorb the strain of running for longer periods of time. Key muscles that need strengthening with lower leg stress fractures are the calves and the shin muscles, quadriceps and Gluteals.